Thanks, everybody for joining us today. We’re very excited to be talking about the fantastic undercard of the Canelo vs. Angulo pay-per-view event, which is taking place Saturday, March 8 in Las Vegas at the MGM Grand Garden Arena and live on Showtime PPV®. Today joining us will be Leo Santa Cruz, Cristian Mijares, Omar Figueroa, Carlos Molina, Jermall Charlo and Eric Gomez, who will be running the call. We’re going to start with Jermall Charlo and Carlos Molina and then work our way up to the other fighters. So, without further ado I’m going to turn it over to Eric to give the notes and make the introductions for the fighters. Eric? Great. Thank you, Kelly. Thank you very much to all the media that’s on the call. We appreciate you guys being on. The co-feature, Leo Santa Cruz vs Cristian Mijares is a 12-round WBC Super Bantamweight followed by Omar Figueroa vs. Ricardo Alvarez, the for the lightweight world championship. Opening up the pay-per-view telecast will be Carlos Molina, the IBF Junior Middleweight World Champion against Jermall Charlo. Saturday, March 8 at MGM Grand in Las Vegas promoted by Golden Boy Promotions and Canelo Promotions, sponsored by Corona and AT&T. Carlos Molina vs. Jermall Charlo is presented by Golden Boy Promotions in association with Warriors Boxing. The show is going to be produced and distributed by Showtime PPV, beginning at 9:00 p.m. Eastern and 6:00 p.m. Pacific. The event can be heard in Spanish using Secondary Audio Programming, SAP. Tickets are on sale now and are priced at $600, $400, $200, $150 and as low as $25, not including the service charges, taxes, available to be purchased at www.mgmgrand.com or ticketmaster.com. 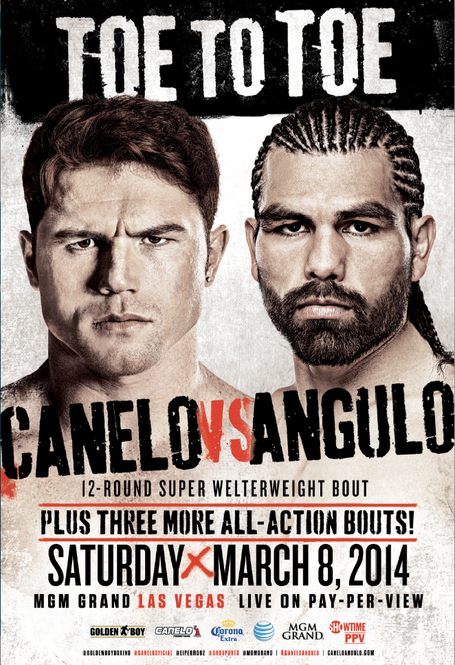 “Toe To Toe: Canelo vs Angulo” will be broadcast to nearly 400 select movie theaters across the country. Tickets are available at participating theater box offices and online at www.fathomevents.com. Okay, after having said that let me introduce to your first our first fighter participating on the undercard. He’s a young, undefeated American fighter, 17-0 with 13 knockouts out of Houston, Texas, first started boxing in September of 2008, has won his last four within the division, including the fifth round knockout of Joseph De Los Santos in December. He’s a twin brother of the unbeaten also contender, Jermell Charlo. He is 23-years-old and this is his first world title fight against Carlos Molina. So, if I can please introduce Jermall Charlo to say a few words. How is everybody doing? I’m just pleased to be on this card fighting in Las Vegas for the second time at MGM Grand on March 8 against the IBF World Champion Carlos Molina. This is going to be a test night for me. I’m prepared for it. As of right now, today, I’m probably nearly just 10 pounds over the weight. I feel strong. Carlos Molina is a great fighter. He’s a world champion. I give him all the credit for even just choosing me to fight him and giving me the opportunity. I’m going to be well-prepared, well-disciplined in the ring when it’s time to go. I just want to give the fans an exciting toe to toe match-up that they’ve been waiting for. That’s great. Thank you very much, Jermall. Now, I want to introduce the World Champion, Carlos “King” Molina with a record of 22-5, two draws, six KOs, originally from Michoacán, Mexico. Now he’s living in Chicago, Illinois. He’s the World Champion. He’s 30 years old. Carlos is probably the most avoided champion out there. It’s incredible. He’s the toughest guy out there and he won the title by beating Ishe Smith in probably one of the biggest Pay-Per-Views in recent history. But, you know what, he’s stepping up to the plate again to defend his title and looking for bigger, better things in the division. So, Carlos, can you please make a few comments? Thanks to everybody for being here. I feel great. The training camp has been going good, top shape, I feel good. I just want to fight and defend my title as often as I possibly can. Like I said before, I just want to keep fighting and I plan to get those bigger fights and decided to take this fight with an undefeated fighter like Jermall Charlo and just whoever they put in front of me, I’m ready to fight and I’m ready to run. Jermall, when you got this fight it caught maybe some people by surprise because your brother, who is also undefeated and was moving along, at this point has a few more fights than you professionally, has maybe fought a little bit better competition than you. Was there anything within the family between you and your brother that was sort of like, oh man, that he said to you that you got this title fight before I did, even though the view was that maybe he fought a little bit better at this point because he had had a few more fights than you had? Yeah, of course, you know, me and my brother we stick by each other’s side and he called me with just a little bit of laughter in between like, wow, you made it, like this is it right here. This is a once in a lifetime opportunity for me. I’m going to make my best to get this opportunity to fight Carlos Molina out of nowhere and just like they doubted my brother, they’re doubting me. So, it’s only making me try harder and it’s only making me grind to my maximum potential where I’m going to shut Carlos Molina out. I believe it was Eric that talked about Carlos is not a guy that a lot of people want to fight because he’s really good and he’s really got a difficult style to fight. You really have to be on your technical game to beat a guy like Carlos Molina. I’m wondering when you look at the way he fights whether it was when he fought against Erislandy Lara a couple of years ago in a draw that many people thought he got robbed in or the fight when he won his title against Ishe Smith not too long ago, what do you see in his style that makes you believe that your boxing skills are going to be good enough to, like you said, shut him out or win a very clear decision against him? The thing is Carlos Molina, yeah, he’s fought great competition; I don’t feel like Carlos Molina lost against anyone he lost to. I feel like he’s an undefeated fighter at heart. But he’s never fought anyone with my size, my power and my skill, so I’m giving Carlos Molina something he’s never seen before and I want to see how he can deal with it. I mean, he’s the most feared fighter in our division right now that has a title and all of the good things, but I’m going to give him something that he’s never seen before, just like he’s going to give me something that I’ve never seen, but I’ll be more prepared than he will be. Your brother just got a big win against Rosado a couple of weeks ago. He’s still undefeated. If you beat Carlos Molina and you become the IBF Champion is there ever a scenario where you and your brother would fight each other in a world title fight? No. Our belts are going to hang up together. A lot of people ask that and I mean, I don’t think anyone would even want to see my brother and me fight each other. They want to know about it, but it’s not going to happen. Carlos, they’re taking you, sticking you in the ring against an undefeated guy who a lot of people think very, very highly of. What’s your perception of the way that your first title defense came about? I mean this is what I wanted. I want full fights, you know. And this was a fight that was also available to me right now at the time and I jumped right in to fight. And, like I said before, I wanted to fight in December and I couldn’t fight Victor Ortiz because they didn’t sanction it, but I’m just very excited. I don’t usually vacation, I don’t need time off or stuff or anything like that. I’m just ready to fight the best and I’m ready to fight for this. Every month if it was available to me, I’d be fighting every month. Whatever they give me I’m willing to fight. Carlos, do you look at the main event and think how will it be? Obviously, a big fight for you to fight the winner, particularly if it was Canelo Alvarez, I mean knowing the kind of fans and money that he brings to any kind of event. Is that really part of the motivation for taking this fight on this card? Well, no, no, not the motivation for it. That was not the motivation. I train hard fight no matter what because if I don’t win I don’t get to advance. And I don’t care what card I’m in or who’s fighting on the main event, to me I’m not going to be kicking around Canelo if I can’t get the fight. I’m just ready to fight if can. If I can’t get the fight, I’ll fight Jermall Charlo then I’ll fight his brother also. That’s what I want, I just want to fight. First of all, can you reflect on your brother’s performance and how does that motivate you going into a big fight like this, obviously, your biggest opportunity of your career, in terms of the way he handled it and how that rubs off on you? Gabriel Rosado, as everybody knows he’s tough and he has nothing to lose, just like Carlos Molina. I know Carlos Molina has his world title that I’m so hungry for. He has nothing to lose fighting me, the way I feel about it. He is the storm. Just like my brother weathered the storm, I’m going to weather the storm also. Okay, is there anything about his style that you find particularly difficult, pretty much everybody he’s fought has found it to be hard. He’s rugged, very sneaky, he can brawl at times. Do you characterize his style and what it takes to beat somebody like him? Carlos Molina is a beast and I’m taking nothing away from Carlos. Everything he wants to do in the ring, he knows how to win, obviously. He’s the world champion. I don’t want people thinking that I’m thinking that Carlos Molina isn’t what he is and I know he’s a monster in the ring so I’m not necessarily worried about his style, I’m not necessarily worried about what he’s going to do. It’s all my God-given attributes that will display the victory for me. Carlos, obviously, it’s been referenced already over your career the hard luck you’ve had to get in this position, how close your fight was and almost unlikely it was for you to win the title against Ishe Smith, which you did. Given what you’ve been through can you characterize how motivated and determined you are to keep your title? I mean, it was a tough road. But I don’t want anybody to feel sorry for me or anything like that. That made me a better fighter and I wouldn’t have it any other way, winning my title the way I did. I’m always motivated. I know how hard I’ve worked to get to this point and I’m just, I’m so focused in every fight. Every fight I treat the same. I treat every fight equally because without winning I wouldn’t be here, so every fight to me, I train like a championship fight, so this is no different. I’m just going to be in top shape and ready to fight. You’re fighting a very young, talented, big, athletic fighter. Other than his youth, what are the things that are different, if at all, about him than anyone else you’ve fought? I mean, it’s hard to tell. It’s always hard to tell until you get in the ring and experience it for yourself. We’re just going to give ourselves; I would picture him being even better than what he is right now so that when you go into the ring you’re ready for anything. So, you know, he’s got that jab, he’s got that height and that’s what he uses real good, so we’re just going to take that away from him. Carlos, people have alluded on this call that basically you have a very awkward style and people find you hard to fight. Obviously, it makes you pretty avoided. How would you describe your style if you had to describe it? They always say awkward. They say awkward because I feel like they can’t figure it out. So, if you can’t figure it out they just call it awkward. But if anything my style is just smart, sneaky, aggressive, just never do the same thing, always adjusting. And that’s what I do and I’m always thinking no matter what. You’re not always going to see the same fighter under every fight because you’ve got to fight different fighters different. With this fight it’s no different. I’m just going to adjust to whatever he brings and whatever he does and I’m ready. Do you think it’s more how you train or is it you as a person, it’s natural for you to be awkward and just have your movement in the ring? Is it something that you consciously make an effort for, I guess, not able to be adjusted to? Well, yeah, you’ve got to look at who you’re fighting and what they do the best, and then what they do the best, you try to neutralize that. And you just go off that. If he edges up, then I edge up again. It’s always, it’s like a chess match. They think I’m awkward or a certain style is there. The next thing you know, you take it away from them and you just keep adjusting. You never do the same thing over and over again. Jermall, have you been sparring with Erislandy Lara or have you been claiming to do that? And has he given you any advice on what to expect with Carlos Molina, seeing that he’s basically the only person to have actually beaten Lara? No. His fight with Molina was not advice for me. I’m trained by the great Ronnie Shields. He has a great game plan for Carlos Molina. Ronnie Shields actually lost to Carlos Molina twice, so I don’t think a third time it’s going to happen and we’ll just see how the fight plays out once we get in there. Was it Carlos who chose you or you did you guys kind of come together and start negotiating from the table because you wanted to fight each other? Every fighter, 154 pound division that’s trying to rise to the top where the fighters at the top kind of know what’s going on with each other. At heart, Carlos Molina got turned down by the sanction when he was going to fight Victor Ortiz, which I would have thought he’s the guy. I’m actually further down in the rankings and it’s a lot of guys that really wanted to fight. And I’m working with Al Haymon, who is the best in boxing and he manages my card and every time I fight he tells me, look, you’re only getting better and better, smarter and smarter, keep trying it and one day we’re going to get that big shot. And sure enough, it happened. Before we introduce the next fighter, if we can have a closing statement from the champion, Carlos Molina. Can you just make a closing statement, please? Yeah, I want to thank God for giving me this opportunity and letting me be as successful as I’ve been in the sport that I love. And I’m ready to put on a show on March 8th and I bring the fight to Jermall Charlo and I’m ready. And the challenger now, Jermall, can you please make a closing statement? My closing statement is just I want to thank God for just giving me this opportunity. And, Carlos Molina, can you hear me? I’ve got a lot of respect for you, man, but when it’s time to fight I respect no party. So, now we’ll introduce the next fighter. He’s the newly crowned WBC Lightweight World Champion out of Weslaco, Texas. He’s a hard punching fighter, exciting, he’s only 24-years-old. Figueroa, he’s undefeated and he’s going to be in a tough fight come March 8th. He’s fighting Ricardo Alvarez, who is Canelo’s brother, and in one of his most recent fights Figueroa won a unanimous decision in what many people consider, including myself, as one of the best fights ever. These guys threw so many punches. It was a fight of the year candidate against Nihito Arakawa, and he needed to take a little time off after that fight it was such a grueling fight. It was an exciting fight and now he’s back March 8th to defend his title. So, Omar, are you on the line? Yes, if you can make a couple of opening statements and then we’ll open it up for questions. Omar? For sure, we’ll start off saying thank you, guys, at Golden Boys for the opportunity I’m in, my team, everyone making it possible, the WBC. I know I just lost strength, again, but it’s a strong organization, staying at the top of boxing for a while, so I know it will get back to where it was at. But other than that I’m grateful, I’m excited and I’ll be ready come March 8th. I want to ask you about, going back to, Eric mentioned the fight you had with Arakawa last summer. First of all, if I remember correctly, you hurt both hands in that fight, right? How are they now? Because it’s been, you’ve had now a number of months to rest them and make sure that everything is okay. How are those hands? The hands will be all right come March 8. That’s not going to be a worry. Whether they feel fine or whether they don’t, either way the fight is going to happen. And if I mess them up during the fight, it’s going to be the same thing as what happened to me in the Arakawa fight. I can’t stop, I won’t stop and not my hands, not anything like that. So, you’re still going to get a good show regardless. Okay. A lot of people thought that was, in fact, the fight of the year last year, like Eric was saying. It kind of came out of nowhere. I think a lot of people knew Omar Figueroa and the kind of style you bring to the ring, but most people were not familiar with your opponent. When that fight was over, what was it like over the next few weeks, few months, when you would see boxing fans? Can you describe sort of the reaction you would get when people would come to you and talk to you or ask you about that fight? Because it sure made a big impression on a lot of people it seems to me. Yeah, there was certainly I couldn’t expect it; me and my team did not expect that. We honestly felt like we were going to get him out of there in two or three rounds. And it was headed that way until I hurt my hand. It’s like Carlos was saying, it’s a chess game in there. And as soon as I hurt my hand, everything changes, a million things goes through one’s mind. And, like he said, you have to adjust to whatever, adjust better in the ring and more than likely you’re going to be the winner. I feel like that’s the reason I fight and that’s the reason I fight and what I do because when it comes to thought or movement, I can do that and I do that well when I’m in training camp. Training gets a little heavy and a little tiring and I do take some days off and on those days I box and I avoid getting hit or I avoid mixing it up. It just gets boring to me. So, the reason I don’t like to do that is because it gets boring. And I know I look like I got hit a lot or like I took a lot of punishment, but in reality I didn’t. Now, Arakawa is fighting on the undercard also against Linares, so when you guys see each other, say, at the press conference or when you’re maybe in the hotel, do you think you guys will have like a, I know the language barrier is there, but I know you guys have a lot of respect for each other; do you think you’ll have a little bit of a high five or handshake or hug or something in memory of that great fight you had? Definitely. It’s an honor, it was an honor to be in one of those fights, especially for me. I look up to the guy, I admire the guy because he has tremendous work and will. He has balls of steel and the heart of a champion. To be able; because we know how hard I hit, I know how much damage I dealt and for him to be able to take that and smile and remember where we were at because other fighters didn’t remember where we were at, he’s just, I don’t know, an amazing human being when it comes to in relation to boxing. So, yes, definitely he’ll get a hug, a high five, a handshake, whatever it takes. I’m grateful to have fought him. When you fought that fight you ended up with the interim title. And then when Adrien Broner decided to stay as a welterweight and was stripped of that title because, obviously, he hadn’t fought a lightweight for quite a while and then you were moved up to the WBC’s full champion. Did it take away anything that you weren’t able to; you won the fight in the ring and they gave you the belt, but you know you were the interim champion. Does it take anything away for you to get it sort of like with a letter or a phone call or a message as opposed to standing in the ring hearing Jimmy Lennon call you, “and the new World Champion”? Does it in any take away from your enjoyment and what you feel about your accomplishment? In reality, it doesn’t really phase me because I don’t really fight for titles. I don’t fight for belts. I fight for something like what you saw on July 27, which is that kind of fight, like knowing that you were in that kind of fight, the reaction I got from the people, the respect that I earned from my opponent and just the fact that everybody, even the casual boxing fans, everybody loved that fight. And that’s what I fight for. I could care less for titles. I mean, yes, they mean more money, but other than that it doesn’t mean anything nowadays because it’s so, I don’t know how to explain it. But it didn’t matter. Whether I was the champion or now, I’m still going to train the way I train the way I train. I’m prepared for every fight and I’m just willing to go out there, balls out, and try to give the fans the best show they can possibly see. So, title, it doesn’t really matter to me. Like I said, at the end of the day it means more money, but other than that, a title is just a title. I think the boxers need the belt and I’m going to try to make the best of that belt. Omar, great fight last time, the kind of fight that Mexican fans like and, obviously, if they’ve seen that fight that’s probably what they’re going to expect this time. Having said that, you’re also going to be in against the brother, the older brother, of a Mexican icon and there are going to be a lot of Mexican eyeballs on this telecast. What does that mean to you by extension with your being a Mexican-American and knowing that they’re going to be watching your fight, possibly more because of him, but maybe also as much because of you and your style? Like I said, that doesn’t really faze me when it comes to fighting. It won’t change the outcome of a fight or it won’t have any effect on a fight whatsoever. But I’m going to perform like I’ve always said. I’m going to go out there and give 150% and whatever it takes to win, that’s what I’m going to do. And the main reason we took this fight was because it did represent a good opportunity in the sense of the fan base and the people that would be watching and the amount of people watching. So, other than that, it doesn’t mean anything, but it’s just numbers. Can you talk more about your thought process when you talk about the fan base and the amount of people and am I wrong in referencing the fact that there are going to be a lot of Mexicans watching this? Oh, yeah, definitely. I mean we have the biggest Mexican fighter right now fighting on that card, so yes, definitely there’s going to be maybe 80% of people watching the fight are going to be Mexican and then to have his brother, have his name out there against me, so that just represents a great opportunity. It’s perfect for me. It’s a perfect platform for me to get my name out there and whatever and I know that the WBC is the Mexican organization, so knowing that it just passed and that for the amount passed and that was given to me and everything, so people are definitely going to be turning out for that fight. Is there a part of you that kind of pinch yourself for the way things have kind of worked out, that your fight wound up being the interim title and that the WBC belt is based in Mexico and that you are fighting on this card? It just seems like it’s, I don’t know what to say, more than coincidence, but it just seems like you said, perfect. No, sir. This may be a dream come true, but it’s something that I envisioned myself in. I saw this coming a long time ago. And I guess it’s something that you have to, to be great you have to think great thoughts and you have to feel great. You have to train like you’re great. Everything has to be like you’re the greatest and that’s what I’ve been doing. I’ve been preparing like I’m the greatest. I’ve been training like I’m the greatest. So, I guess you can call it power of suggestion or whatever you want to call it, but it’s just a mentality that you have to have. So, no this doesn’t feel surreal. It just feels like it came in due time. So, I guess other than that, it just came in due time and I’m just going to keep grinding and keep working as hard as I’ve been working. What do you think about what Ricardo is trying to do? He’s trying to become the third brother, which would make history, in one family to become a world champion? I’m very thankful and gracious for this opportunity to be on this card and to be fighting and defending my title. Obviously, I know that Ricardo, my opponent, is going to be motivated. He’s going to be motivated; he’s trying to make history. He’s trying to be the third brother in the same family to win a world title. But, obviously, I’m the world champion and I’ve got a lot of say and I’m going to do my part so that that doesn’t happen and I’m going to be well prepared because I know that he’s coming and he’s motivated. And if he saw my last fight he’s in for a tough fight and he’d better be in shape for 12 rounds because I’m going to be in shape for 12 rounds and I’m going to defend my title. I had a conversation with Joel Diaz, who is your trainer and Joel seems to think it’s going to be a fight that’s going to end, it’s going to end before five rounds, that the way you are training right now, the way you’re looking, he should be able to get a quick knockout and knock him out within five rounds. Omar, do you believe that? Do you think that you’re capable? I mean, you’ve had a long layoff. The last fight was a tough fight. Do you feel that you’re in position to deliver on that kind of a statement that Joel Diaz is making? Joel has some validity to what he’s saying. He’s the one that’s training me, he’s the one that’s watching me and he notices everything I do and the hard work I put into my training camp and my craft. Most of the time, most of my fights, the majority of my fights, have ended within two or three rounds and it just happened to be that in the last fight I hurt my hands and I didn’t hold up, but I was still able to go 12 hard rounds and that’s what I’m preparing myself for. I’m preparing myself to give it my best and to be in the best shape and to give a good fight and, obviously, yes, I am going to be looking for the knockout. But if it doesn’t come, if the knockout doesn’t come and if I happen to hurt my hand again, then I’m mentally strong and I can adjust and I know that I’m going to be ready to go 12 rounds and do what I have to do so I can win this fight. So, I’ll be ready. I’ll be ready regardless. Okay, great. Thank you very much. Omar, thank you, once again for being on the call. I know that you’re busy in training camp. So, if you can just make a couple of closing statements before you hang up. Yes, definitely. Again, I’m just thankful and grateful for this opportunity. I’m definitely not going to disappoint my fans when it comes to effort. That’s one thing I make sure of and that’s one thing I train to make sure that I don’t do. So, I would just expect the best Omar Figueroa and I would expect a good show. Best of luck to all these fighters and may God protect them during the rest of their training camp, my opponent and everyone, have great training camps and make it safely to the fight. All right, so now to introduce our last two fighters on the call. This is the co-feature, Leo Santa Cruz is going to be on the line as well as the challenger Cristian Mijares. This is going to be a 12-round WBC Super Bantamweight World Title. Obviously, Leo Santa Cruz is the Champion. He’s going to be defending his title against the former Champion and challenger from Gomez Palacio, Durango, Mexico. He’s a former three-time World Champion. He’s 32 years old, Southpaw, one of the best fighters in Mexico. Cristian Mijares is 14-1 in his last 15 fights, dating all the way back to November of 2009. His only defeat came in a world title fight and it was a split decision, controversial split decision against Victor Terrazas and he’s looking to give Leo Santa Cruz all he can handle on March 8th. So, I want to introduce to you Cristian Mijares. Cristian. I would like to say hi to all the press. Thank you for being on the call. I’m very happy and motivated to be on this fight card and to be fighting against Leo Santa Cruz for the title once again. Obviously, Leo is a very good fighter and I’m excited to be fighting him and ready to get my chance at the title to become a world champion again. So, thank you all for being on the call. Now, I want to introduce the World Champion. Leo “Terremoto” Santa Cruz. He’s undefeated, 26-0, 15 knockouts, originally from Michoacán, Mexico, now he’s living in Los Angeles. He’s widely recognized as one of the highest volume punchers in the game today, broke on to the international scene June of 2012 when he won the IBF Bantamweight World Championship. Last year he mowed through Alex Munoz in May, earned the Super Bantamweight World Championship after knocking out the Champion, Victor Terrazas in August. And in December he had a very tough fight against Cesar Seda, but was able to win the fight and convincingly. So, now he’s facing a mandatory challenger, Cristian Mijares, which promises to be a very, very good co-feature and very good fight. So, Leo, if you can please say a few words. Good afternoon, everybody. I want to thank to Golden Boy, Richard Schaefer and my manager Al Haymon for this opportunity, always putting me in great card. I will try really hard not to disappoint. Three quick questions for you. One, two years ago Oscar De La Hoya said you were the best kept secret in boxing and since then you’ve fought on network TV on CBS, you fought on Pay-Per-View on Showtime. Do you think you are no longer the best kept secret in boxing? Hopefully, that’s what I want to be, a good fighter. And I’ll leave it up to the people and if they think I’m a great fighter, I can’t say it for me, I can’t really say that, I guess. But I think I’m doing my job, I’m training hard to become that and if people say it, then it will be fortunately so. I’m going to keep on working hard, training, so that people can be talking good about me and think that. Do you think people have a better idea and know who you are now more so than they did maybe two years ago? I thank God for bringing Al Haymon, my manager, into my life, Golden Boy and Richard Schaefer. And Showtime, because for them they were the ones that gave me the foot here, they were the ones giving me this big undercard. If it wasn’t for all the people like that, nobody would know me because I wouldn’t be on Showtime, I wouldn’t be on this undercard Pay-Per-View like I am now. So, I think I owe that to my manager, to my promoter and Richard Schaefer and Showtime. My second question is since you became Bantamweight Champion a few years ago and now you’ve become a Super Bantamweight Champion, two weight classes. How is it different for you when you go into the ring knowing that you’re the hunted rather than the hunter when you were pursuing that first title? Is there a different mindset about the way you go about your business in the ring, knowing that you’re defending titles rather than chasing titles? No, it feels great. I say that to myself that I’m doing a great job. Before I was the one chasing and now when I hear that people want to fight me, they ask people who do you want to fight and then they say Leo Santa Cruz, it shows that I’m doing something good because they want to fight me, so it just makes all the hard work I’ve been doing and just staying up to really; at the same time it gets me more motivated. It keeps me training harder and trying to learn more. A lot of outsiders are trying to fight me to take that away from me. My last question, Leo, is as you’ve fought a few experienced fighters the last couple of years, guys with a lot of time in the ring, what will make fighter Mijares different than fighting some of the other guys you’ve faced who have had a lot of experience? I think that as I’ve been watching his videos, he’s being trained by, he has a lot of trainers that I see a really good fighter. He’s fast and everything, but everything like that tells me I started working in the gym. So, I think that all the experience, like I sparred with people with great experience, Ponce De Leon, all those Mexicans, a lot of fighters with great experience. So I think in the gym is where I’m learning and when I go out there in the fight I just go and do my job and try to do everything like they tell me and just go out there and give the best, do a great job. It’s a little easier for you to fight more experienced guys now than maybe it was a couple of years ago when you were still kind of learning, right? You’re much more comfortable fighting older, experienced fighters now, aren’t you? Yeah. Those are the fighters I like to fight, they’re more experienced, they adjust more to my style better than fighting like a wilder fighter because they come in, they’re wild. When you fight those experienced fighters your timing is better, everything you do, better punching, everything is better. So, I think those are the fighters that make me work harder. Leo, you have said in the past that you’ve had fighters whose style you idolize or at least try to emulate. Can you name a few of those fighters? I believe you had said Julio Cesar Chavez was one of them and, if so, what about your style is reflective of theirs do you believe? When I was growing up we used to watch Chavez videos and he used to teach me that he loved his body shots and the pleasure that when he grows forward boxing. And my dad, since I started boxing my dad always taught me that body shot, so it’s back to the fact that when you get to that level…. But, that’s what we did, always in the gym practicing, going forward. And like Chavez after he came through a title, his style after he used to fight, box, like to punch and move. That’s how we try to do. When we have to box we’re going to box, if we have to go and pressure, we’re going to go pressure. We’re trying to learn from everything. My last question is in your last fight Cesar Seda was very clever. At times he exchanged body shots with you, very exciting fight. What did you take away from that fight that you can improve on that will help you in this fight? I don’t think you were quite able to do everything you wanted to do with him and had to make adjustments. What did you learn from that experience? He was a great fighter and he came ready, he wanted that title and he showed that night. But we, I think had to box a little more and I think we’re going to that now for Mijares and I’m in the gym training really hard and little by little we’re going to be practicing how to fight those kind of fighters that move a lot. The name or the fighter that guys both have in common is Victor Terrazas. Can we measure both of you guys or your fight against fighting Victor Terrazas? No, it’s very different. There’s no parameters between Victor Terrazas there’s no comparison. It’s very different. It’s about styles and Leo has a different style. But I think that we both beat Victor Terrazas. Obviously, I didn’t get the decision, but I think that I wore him down. I hurt him in the fight and I prepared him for Leo. But I’m going to be well-prepared for this fight. This is going to be a different kind of fight against Leo and I’m going to be well-prepared and I think that we’re going to be, both, giving it our all and it’s going to be a great fight. Yes, I agree with Cristian. It’s very different. This is about styles. It’s a different style and even though we both fought the same guy, it doesn’t mean that you can measure us on that fight. But I’m glad that he’s training hard because I’m also training hard and I know I’m fighting a very, very good fighter in Cristian Mijares, so I have to be 100%. And that’s all I can expect. I’m going to be ready and I know he’s going to be ready and I’m sure we’re going to both make it a good fight. In your last fight with Seda you actually fought a very good disciplined fight. You kind of gave yourself a low mark in that fight, even though I thought you performed fantastically. Do you feel that you have to top each performance and each fight as you go along in your career? Yeah, I think as I go I think I can be learning more and to be improving, the more I’m winning and the more I’m picking better opponents, better fighters, fighters those kind of fighters are better, so I think for every fight I need to be adjusting a little more and that’s what we’re doing in the gym. My dad is teaching me and we’re practicing and we’re trying to learn little by little so that when we get to those points we already know how to fight those fighters and in every fight we’re trying to do that more and I think that’s what’s showing and I’m just glad and I’m training harder every time. Before you fought on network television, the pre-fight segment it shows that you mainly fight for your family and, basically, for your brother and his serious medical condition. It’s been over a year later. What’s the prognosis today? How is your brother doing and has his condition gotten any better? We were really like struggling and I always want to give my family a better life and thank God that he gave me the talent to become a boxer and be good at it. So, for my brother, he’s doing a lot better since I fought the Munoz fight, he was in the hospital then during that fight. But ever since that fight, he’s been great. He hasn’t gone to the hospital. He hasn’t been hurting. His muscles are better, everything. Before like every week he used to go to the hospital because he would be hurting and when it was cold his body would swell up and he could not even walk or anything. And now, none of that has happened. I thank God that he’s been great. It’s been already I think a year and he hasn’t even gone to a doctor, only for a check up and stuff like that, but not to stay in the hospital because he’s hurting or anything. So, I’m really glad and happy to have him like that. Cristian, do you consider this your last opportunity to become a world champion? No, not at all. I don’t think about that at all. I’ve been asked that before, but I don’t think about that at all. I’m going to be a world champion. I’m going to win on March 8, I’m going to be a world champion. That’s the only thing on my mind and I’m very motivated. I’m very motivated for this fight. I know I’m fighting a very good fighter and the World Champion in Leo Santa Cruz, but I’m motivated for this fight. I will be the World Champion and I’m ready for bigger and better things, to be considered in the big fights once again. So, that’s all that’s on my mind. Do you see Leo as more of a complete fighter? He’s a two-time World Champion. Is he more of a complete fighter than Victor Terrazas when you faced him? Can you compare them? Of course he is. He’s a way better fighter, of course he is. It’s going to be a difficult fight. He’s more of a complete fighter, it’s going to be a difficult, complicated fight, but that’s what I want. That’s what motivates me. I’m concentrated on this fight 1,000 percent and, yes, that’s what motivates me, that he is such a better fighter. Leo, this is a fighter that you’ve admired when you were coming up. He was a former Champion, you followed him, you admired him. Can you talk to us a little bit about that? Yes, I admired Cristian and I followed his career when he was coming up, when I was first starting, he followed his career. I admired him and I knew that at one time, sooner or later, I was going to be at that level and possibly even fight him. And, lo and behold, here we are. I’m going to be fighting Cristian Mijares. We’ll do some closing statements with both fighters and then we’ll conclude the call. Thank you all once again. It’s going to be a great honor for me to be in this card, to be fighting. I’m very gracious to be fighting against Leo Santa Cruz and it’s going to be a war, it’s going to be a very, very good fight. It’s going to be a war. We’re going to give an exciting fight to all the fans and hopefully God, both fighters don’t get hurt and may the better man win. I just want to give thanks to my manager Al Haymon, Showtime, Richard Schaefer and for giving me this opportunity and keeping me fighting on this big undercard. For me it’s an honor to fight on this undercard of Canelo and to fight a great champion like Mijares. And I want to give thanks to all the fans all over the world because they’ve been supporting me and they’ve always been there to encourage me and keep me motivated to train harder. So, I want you all, the people, to watch us on pay-per-view or to come out and support us on March 8th because we’re training really hard to give a great, great fight for you guys. And we’re just motivated and you guys are the ones that keep us motivated, so March 8th you guys are going to get a great fight because that’s what we fight for, for the fans and to able to go home happy. Thank you. Great, thank you. Thank you very much, Leo. Thank you for being on the call. And thank you, once again, to all the media that called in for this very important conference call. Once again, Saturday, March 8th, MGM Grand in Las Vegas, Toe To Toe, distributed by Showtime, you can get it on Showtime Pay-Per-View. Tickets, tickets are still on sale at the MGM Grand garden office, box office. You can go on the website,www.mgmgrand.com or at Ticketmaster, www.ticketmaster.com. Thank you very much. Have a beautiful week.